This super easy Christmas kids craft is a tradition in our home. 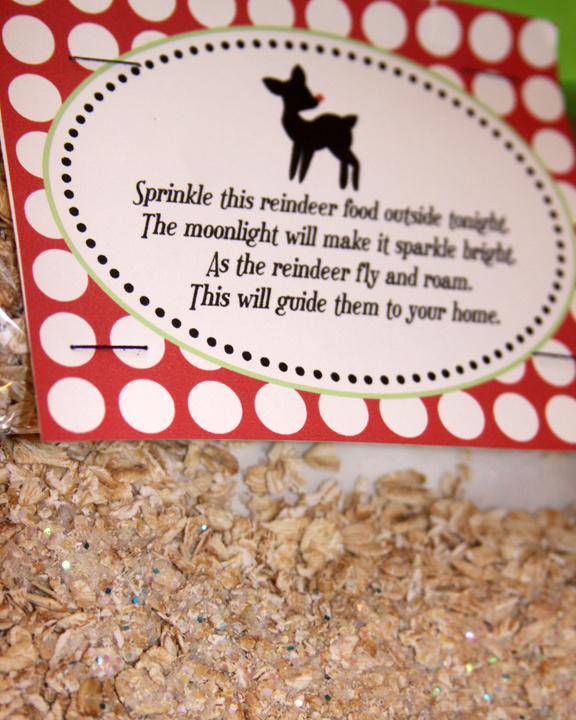 Make some magical reindeer food to help Santa’s reindeer spot your house! Your kids will have as much fun making this as they will spreading it onto the lawn on Christmas Eve. With a few supplies you have a great activity for the season. Making reindeer food with the kids is a little tradition that we have been doing for the past three years in our house. It is a quick, fun, and very inexpensive activity to get your kids excited for Christmas. This was one of the activities the kids found in our advent activity calendar this year. This is not a new idea, but I had never heard about it until I had kids of my own and was looking to start some new Christmas traditions. I thought I should share it with you in case you have not heard of it yet. 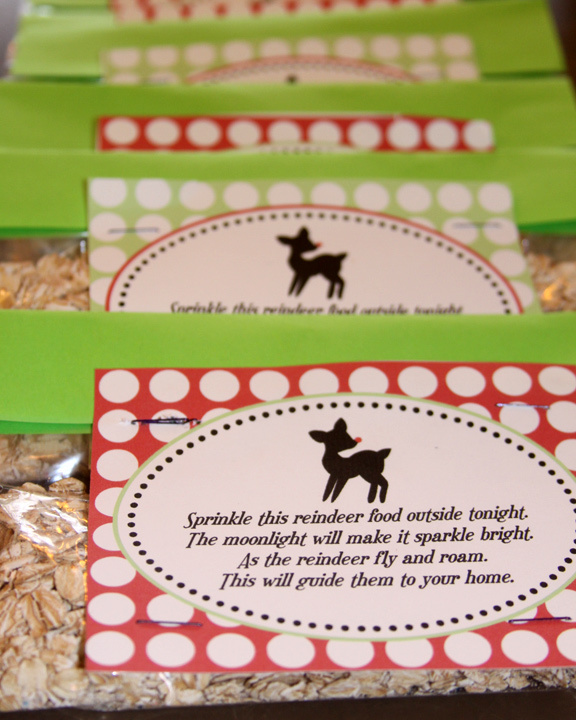 These are little packages of magical reindeer food, that when sprinkled on your lawn on Christmas Eve, draw Sanat’s reindeer to your home. There are a couple other versions of the poem out there but I like this quick and simple poem for our young kids. 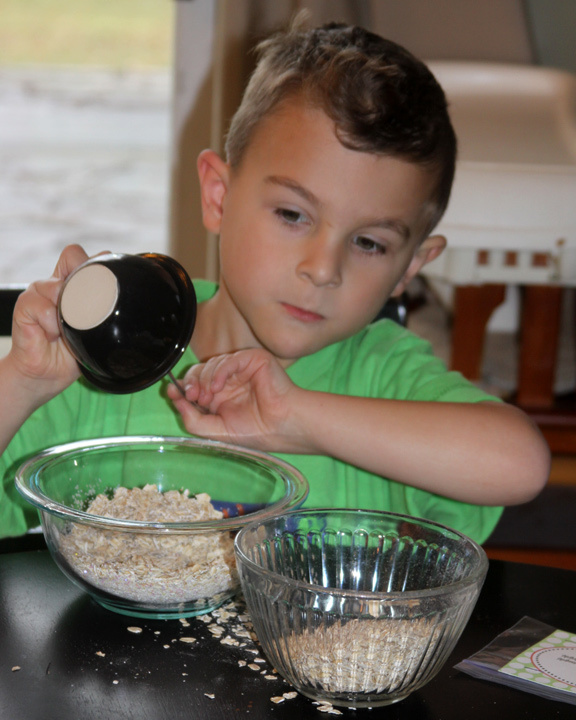 Your kids can create this magical reindeer food using just a couple of ingredients. You mix some oats with any color glitter you like. You can also use sugar or colored sugar sprinkles. 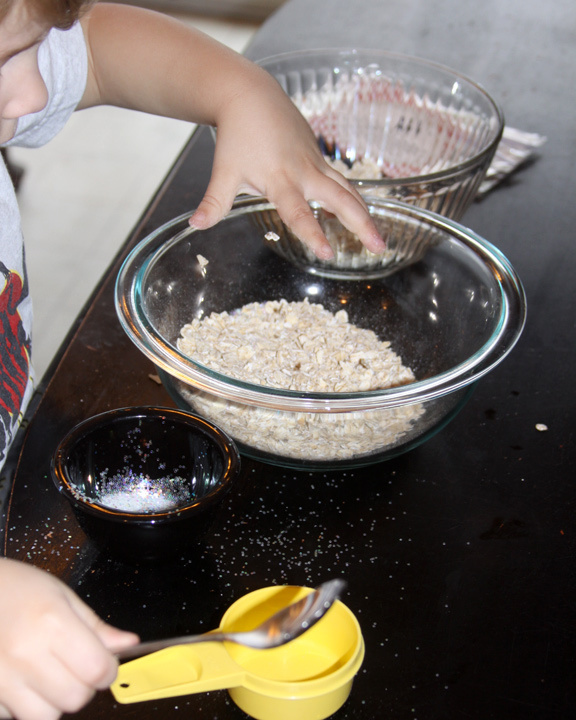 My kids love to dump the ingredients together and stir things up. I use little Ziploc snack sized bags. They are easy to close and are the perfect size for a small amount of magical oats. You can use whatever you have though. Little bags with a ribbon tied around work just as well. I like to let the kids mix things up and add their own glitter. Then they use a spoon to fill each of the snack bags with the reindeer food. After the bags are closed I staple a small strip of green card stock paper folded in half over the top of the bag. 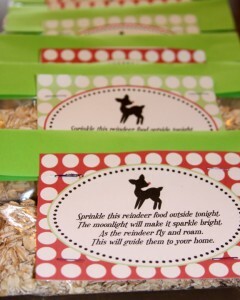 Then I also stapled these adorable reindeer food poem cards over the top of that. 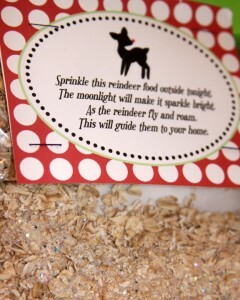 I found the reindeer food tags as a free printable from the Tomakat studio. They are so, so cute! This was my favorite printable available online. I just adore that little vintage reindeer. These make awesome little gifts for your kids to share with their friends around the holidays. I have also made theses to hand out to the Children at our extended family Christmas parties. The are really inexpensive to make and are adorable to give as gifts. If you are entertaining this holiday season make them and set them out in a little basket. They are a great parting gift for your guests. My kids always spread their reindeer food in the yard on Christmas Eve and, yes, my husband and I are out there in the middle of the night trying to make it look like the reindeer were their eating it. What we won’t do to see that unbelievable smile on our Children’s faces, right?